With: Anna Adamolo, Anonymous, Billboard Liberation Front, Burning Man Festival, Cacophony Society, Janez Janša, Janez Janša, Janez Janša, Julian Oliver, Laura Poitras, Les Liens Invisibles, Luther Blissett, Mail Art, Neoism, Peng! Collective, Suicide Club, Telekommunisten, Trevor Paglen. With: Annie Machon (UK), Bani Brusadin (ES), Baruch Gottlieb (CA/DE), Dmytri Kleiner (CA/DE), Florian Cramer (DE/NL), Ida Hiršenfelder (SI), Janez Janša (SI), John Law (US), Loretta Borrelli (IT), Luther Blissett (IT), Tatiana Bazzichelli (IT/DE), Vittore Baroni (IT), Vuk ?osi? (SI). In the business world, disruption means to introduce into the market an innovation that the market does not expect. This innovation comes from within the market itself. Transferred into the field of art and activism, disruption means to generate practices and interventions that are unexpected, and play within the systems under scrutiny. Art, hacktivism and business are often intertwined, generating a feedback loop of revolutions and co-optations that is functional to the development of capitalism. Capitalism needs our revolutions because they generate new lifestyles, products and practices that create new markets and consumer desires. Similarly, systems of power need our resistance and opposition because they serve to increase security and forms of control. We need to find new strategies that go beyond the mere act of opposition and that are harder to appropriate. Networked Disruption is an exhibition and a series of events produced by Aksioma and Drugo more in collaboration with several partners and curated by Tatiana Bazzichelli. The exhibition, hosted by Škuc Gallery in Ljubljana and the Museum of Modern and Contemporary Art in Rijeka, is centred on the concept of “Networked Disruption”, as an opportunity to show new possible routes of social and political action in the line of disruption. 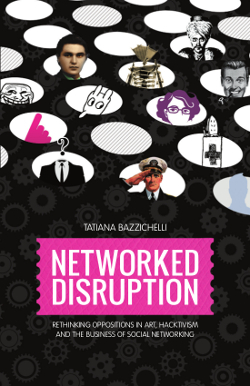 It is based on Bazzichelli’s book “Networked Disruption: Rethinking Oppositions in Art, Hacktivism and the Business of Social Networking/(DARC Press, The Digital Aesthetics Research Centre of Aarhus University, 2013). The exhibition shows a diverse constellation of networking projects that aims to actualise – and to question – the notion of “networking”: Anna Adamolo, Anonymous, Billboard Liberation Front, Burning Man Festival, Cacophony Society, Janez Janša, Janez Janša and Janez Janša, Julian Oliver, Laura Poitras, Les Liens Invisibles, Luther Blissett, Mail Art, Neoism, Peng! Collective, Suicide Club, Telekommunisten, and Trevor Paglen. In this exhibition we adopt the concept of disruption from business and we propose works that emerge from within political, economical, technological and art systems. They play with their power logic generating virality, anonymity, semantic confusion, multiple truths, and disruption. Diverse points of view are combined, among the groups and within the groups themselves. By keeping such connections open without reaching a curatorial synthesis, we invite visitors to create their own path in the line of disruption. The artworks and collective projects are conceptually and visually interlinked in the exhibition spaces, which constitutes a network of networks. By applying the strategy of “working from within”, some sections of the show are conceptualised in collaboration with people deeply involved in the networks under scrutiny: Vittore Baroni (Mail Art), Florian Cramer (Neoism), Gabriella Coleman (Anonymous), John Law (Suicide Club and Cacophony Society), Andrea Natella (The Luther Blissett Project) and members of the Anna Adamolo network. This choice reflects the perspective that a new methodology of curating a research should open a metaphorical (and physical) space to encourage and provoke feedback loops among theory and practice, and among subjects and objects of analysis. détourning it by operating disruption. The challenge is to collectively rethink oppositional hacktivist and artistic strategies within the framework of (social) networking, information economy and increasingly invasive corporations and government agencies. Technicians: Atila Boštjan?i?, Valter Udovi?i? Networked Disruption is realized in the framework of Masters & Servers, a joint project by Aksioma (SI), Drugo more (HR), AND (UK), Link Art Center (IT) and d-i-n-a / The Influencers (ES).